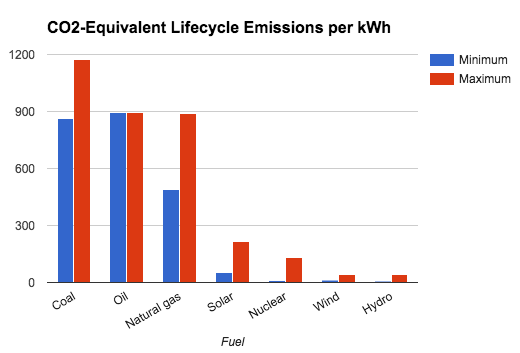 Sources for CO2-Equivalent graph cited through the Emission Factors of Common Fuels table in Wikipedia’s page on Emission intensity. Minimum/maximum variations depend on fuel quality and how the fuel is sourced and processed. You have to use some energy to get the energy you need to use. Changing ratios provide a useful look at energy pinch points. Oil was originally ~100:1, now it&apos;s closer to 20:1.